"She saw what was good in the eyes of God and she did it." Marie was born in a small town called Dourdan in France in 1653. As Marie reached adulthood she took over the family business of weaving stockings. Being a progressive woman, in 1683 she made the bold move to give up hand knitting, bought machines and hired and formed apprentices. She treated them with a sense of social justice and with Christian charity. In 1690, her brother being able to care for the family business she turned all over to him. According to the desire of King Louis XIV, in 1697 she was instrumental in opening elementary schools in the surrounding rural areas, and in the reform of health care. 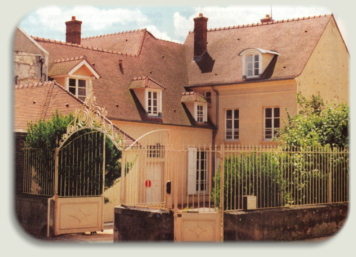 More and more women joined her at her house in Sainville, France from where the community of sisters expanded. Poor country girls who had no place to go were also welcomed there. The sisters were educated in order to teach and to care for the sick. 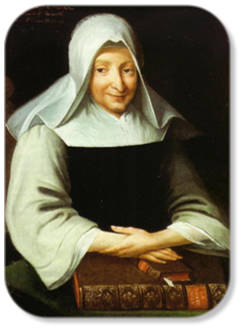 Marie Poussepin wrote a Rule for her sisters that reflects her soul in its simplicity, wisdom, and apostolic charity. The depth of her spiritual and religious growth is manifested throughout her Rule. 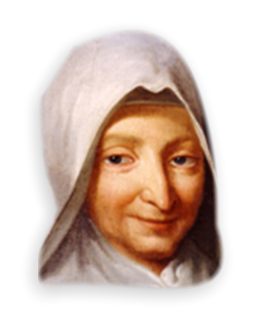 Marie Poussepin was beatified in Rome by Pope John Paul II on November 20, 1994.